Location is everything in the real-estate biz, so it's not entirely surprising that a map changed former developer Donald Trump's mind. President Trump was close to withdrawing from the North American Free Trade Agreement last month, before he saw a U.S. map highlighting areas that rely on business with partners Mexico and Canada. It just so happened many of those states supported Trump in the 2016 election, giving him a strong motivation to renegotiate rather than abandon the pact, he told the Washington Post. The White House declined to provide a copy of the exact map presented to Trump, so Bloomberg came up with its own version. 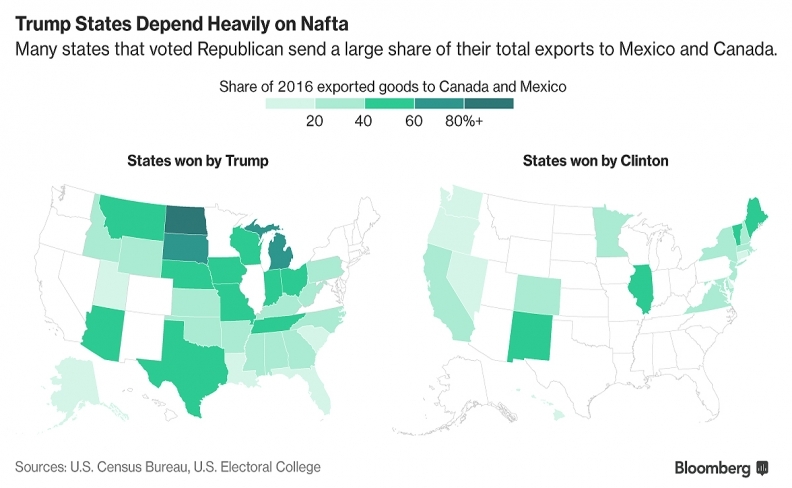 A quick look at export data from 2016 shows manufacturing and border states that voted Republican in the November election depend heavily on trade with NAFTA partners, both north and south of the U.S. borders. The five states with the largest percentage of exports to those countries supported Trump, including delegate-rich Michigan and Ohio, which backed his Democratic predecessor Barack Obama in 2012 and 2008. Employment in those two states is highly linked to manufacturing, such as automobile assembly, which depends on the supply of parts that move freely and frequently between the three countries. NAFTA's demise and a potential trade spat on the continent would disrupt and possibly cripple that flow, and send manufacturers to seek cheaper supplies overseas, according to Joseph Parilla, a fellow at the Brookings Institution. “If we diminish our competitiveness in a way that makes it more attractive for those supply chains to just fully up and leave North America, that could essentially be the death knell for American manufacturing,” he said. That would deal a blow for supporters who flocked to Trump on his promise to bring prosperity back to the Rust Belt states. The data also show agriculture-based economies that voted for Trump like Nebraska and Iowa rely on exports to Canada and Mexico, while the 10 states with the biggest trade surpluses with NAFTA all voted Republican on the presidential ticket last year. For now, Trump seems satisfied to re-negotiate NAFTA provided the talks go in America's favor. But could the president, who called the pact a "disaster" on the campaign trail, have another change of heart? "I would be very surprised if they actually decide to scrap the deal," according to Robert Scott, a senior economist at the Economic Policy Institute in Washington. "There are too many businesses heavily invested in production in Mexico and Canada who would be hurt by doing away with NAFTA."